Man has always wanted to go faster – it gives us something to boast about, and inflates our egos. No surprise then when motorcycles hit the dusty roads, speed was important. A Cycle World graph shows a 1925 Brough Superior was the first production machine with a 100 mph top speed, followed by a 1936 Crocker (110 mph), 1949 Vincent Black Shadow (125 mph), 1962 Matchless G50CSR (121 mph) and a 1962 H-D XLCH (122 mph). 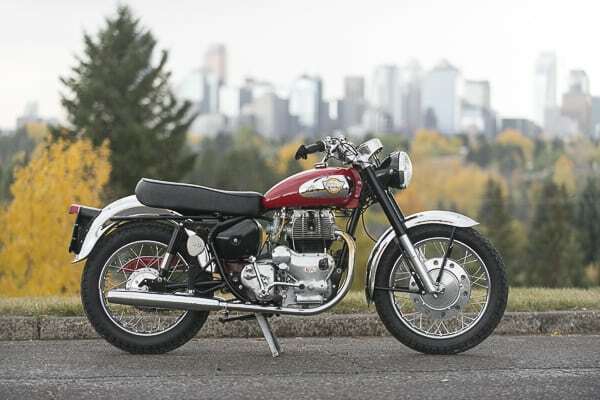 Next up at 120 mph was a 1965 Royal Enfield Interceptor – and it’s a model that Calgary restorer Bobby Baum can’t forget. In 1977 Baum was with the railroad, and says his 60-something year old boss, Donn Parker, was constantly reading classic bike magazines. He had two Royal Enfields in boxes – a 1969 Interceptor and a 1953 Meteor 700. Baum, a millwright, was well versed in Japanese machinery but hadn’t ever restored a Brit-bike. When Parker asked Baum to put the Interceptor together he agreed and soon had it back on the road. Fast-forward to the early 2000s when Baum was searching for an Interceptor of his own. He won the bid on a 1964 model for sale on eBay in Hollywood but after the seller found Baum was Canadian he wasn’t going to ship it to him. After some talking, the Royal Enfield finally landed in Baum’s garage. “It had been ridden hard and put away wet,” Baum says. “There were lots of stripped threads, and it wasn’t a simple case of cleaning it up and getting it back on the road. He took the Interceptor apart and sent the frame and various brackets out for powder coating. The engine was disassembled and rebuilt from the crankshaft up. Geoff Abbott of Harley-Davidson of Calgary machined the barrels to accept oversize pistons, but the most difficult chore Baum faced was fixing stripped threads that hold the timing cover/oil pump to the right side of the engine case – he machined his own metric inserts with the correct 26 tpi inner thread. Baum’s Interceptor sacrificed its rear fender loop and seat bracket to the chopper movement, and he searched hard before locating one just a couple of kilometres from home. Baum made his own fender stays, and the exhaust headers are original with reproduction mufflers. Calgary painter Doug Veness sprayed the gas tank and chain guard a brighter shade of red than stock. With a rebuilt magneto Baum sourced out of the U.S., he thought the bike should fire right up. It didn’t. It took plenty of kicking and cursing, and it wasn’t until Baum sent Lucas mag guru Gregg Kricorissian in Ottawa a photo of the points that the culprit was identified. “Although the rebuilder knew it was for a Royal Enfield, the points and cam ring were set up for counterclockwise rotation. They should be clockwise,” Baum says. With the magneto sorted the bike’s seen 500 miles since 2012, although it’s running with incorrect dual Amal 930 Concentrics. Baum has the correct Amal Monobloc carbs but is hesitant to change anything because, right now, it’s a speedy throwback machine. Quicker top operation and a 23-hp bump versus the outgoing model, the 2020 Porsche 911 Cabriolet arrives this summer starting at US$126,100 & C$143,700.